The line began forming before the Washington Park concert started on a recent Wednesday night, and even before concertgoers grabbed a free hot dog, watermelon and lemonade. Volunteers from Community Pie enthusiastically passed out pieces of freshly baked apple, peach, blueberry, rhubarb and other kinds of pie. 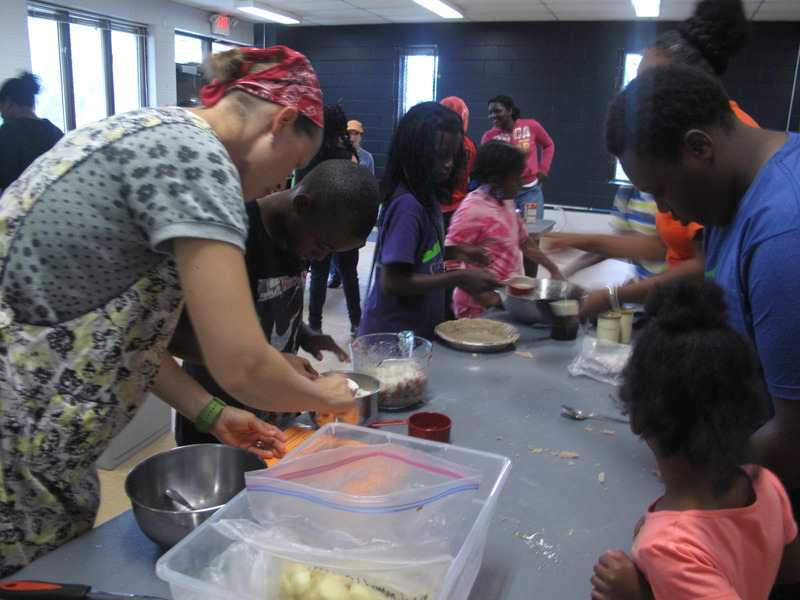 The day before, neighborhood volunteers and young people who live in the Washington Park area made the pies from scratch. The young pastry chefs also come from Our Next Generation and the Young Scientists Club at the Urban Ecology Center. Community Pie was founded four years ago by Amy Peterson and Jessie Tobin, residents of the Martin Drive neighborhood. 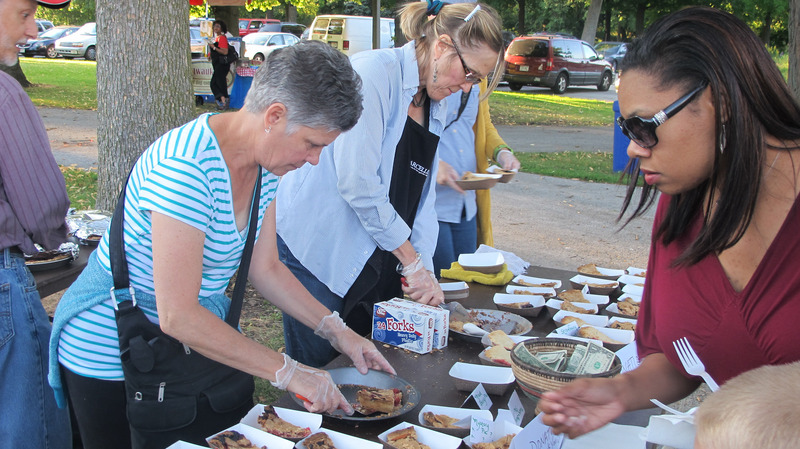 The group utilizes the facilities at the Urban Ecology Center, 4515 W. Lisbon Ave., twice a year to bake fruit pies to serve at a Wednesday at the Shell in Washington Park concert in the summer and at Winter Fest in late January. The slices of pie are free. Jane Konkel, a member of the Washington Park Partners (WPP), explained that Community Pie gets its fruit from local sources including neighbors’ apple, peach and nut trees, as well as from strawberry and raspberry bushes in their backyards. Most of the fruit and baking ingredients come from Wisconsin. Peaches, pears, apples, cherries and berries come from Walnut Way, Door County and Fredonia, while Lonesome Stone Milling in Lone Rock donates natural organic flour for pie crust. Pie pans, utensils and bowls also are donated. Annie Wegner LeFort, an original member of Community Pie, once worked as a pastry chef and enjoys passing along the art of pie making to the kids. LeFort said that there is an educational and a culinary component to Community Pie. “The educational component is learning about the fruit trees and ecology. The culinary component is learning to follow a recipe, make a pie crust, and utilize fruit for the pie filling,” she noted.